I stumbled upon this wonderful website Conscious City Guide which lists events going on all over the world, with one thing in common - these events are all good for you, good for your soul and good for you as a human being, they are 100% created to make you feel better about yourself and why you are on this planet. AND I am pretty sure that some events are free others have an option to purchase a ticket. With headline words like: RETREATS, MOVE, INSPIRE, NOURISH, CREATE, GLOW, and CONNECT you can easily find something going on near you, there are completely obscure or large events - it's all good. I would suggest a visit and see what's going on near you, this is new so I predict it's just going to get bigger and bigger! 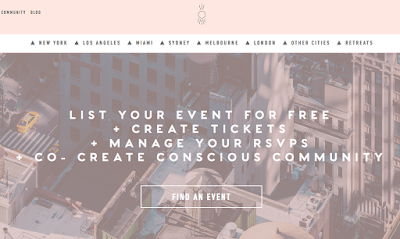 Or maybe you want to list your won event... host a meditation! we are women who woke and want the world to wake. we come from many fields with a unified mission: to raise consciousness. we have come together to collaborate because now is the time to unite, to gather our tribe and allies. I am excited to see this community grow! Perhaps if you are traveling it's nice to check and see if there is anything interesting going on in your destination.... more to do, always more to do!